On Sunday October 15 and 29 from 2 to 5 pm (not October 14 as announced in an earlier post), Grace Baptist Church is hosting a 2-part parenting live stream seminar with Paul David Tripp. I hope you'll make time for this important opportunity. In order to introduce the speaker, today's post features him again as a guest contributor, introducing the principles of his book. In our parenting seminar, he'll be covering the first four topics. 1. Calling: Nothing is more important in your life than being one of God's tools to form a human soul. In a couple brief but profound paragraphs, Deuteronomy 6:4–9 and 20-23 summarizes the value that God places on parenting. 2. Grace: God never calls you to a task without giving you what you need to do it. He never sends you without going with you. Ephesians 3:20-21 provides us with the single redemptive reality that makes parenting possible. 3. 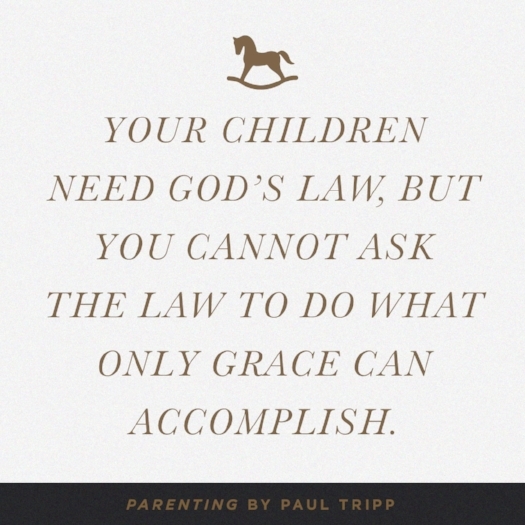 Law: Your children need God's law, but you cannot ask the law to do what only grace can accomplish. Romans 7:7 tells us that we need the grace of wisdom that God's law alone can give, but the rest of the chapter reveals how only the Spirit can produce change. 4. Inability: Recognizing what you are unable to do is essential to good parenting. God has tasked parents with many things, but nowhere in his Word has he tasked you with the responsibility to create heart change. 5. Identity: If you are not resting as a parent in your identity in Christ, you will look for identity in your children. 2 Peter 1:3-9 warns about identity amnesia, and when applied to parenting, it means that if you're not getting your identity from God and the work of his Son, you will probably try to get it from your children. 6. Process: You must be committed as a parent to long-view parenting because change is a process and not an event. Even the world's best teacher – Jesus – had a process mentality and because he did, he was willing to leave his work to unfinished people (see John 16:12–15). 7. Lost: Luke 15 is a tremendous help to parents, because, in vivid word pictures, it sheds light on the condition that is the reason for all you have to deal with in the thoughts, desires, choices, words, and actions of your children. 8. Authority: One of the foundational heart issues in the life of every child is authority. Teaching and modeling the protective beauty of authority is one of the foundations of good parenting. The famous Ephesians 6:1–4 parenting passage is a very helpful for this principle. 9. Foolishness: The foolishness inside your children is more dangerous to them than the temptation outside of them. Only God’s grace has the power to rescue fools. Psalm 53:1–3 reveals that your child has the heart of a fool and because he does, he is a danger to himself and desperately needs God’s arms of rescue that come through your parenting care. 10. Character: Not all of the wrong your children do is a direct rebellion to authority; much of the wrong is the result of a lack of character. Romans 1:25 and 28–32 connects character issues to the most significant of all human functions – worship. 11. False Gods: You are parenting a worshiper, so it’s important to remember that what rules your child’s heart will control his behavior. This should be no surprise, considering how often the Bible warns us (see Exodus 20:3, Deuteronomy 11:6, 1 Samuel 12:21 and many more). 12. Control: The goal of parenting is not control of behavior, but rather heart and life change. No matter how successfully you control their choices and behavior, your control cannot and will not free them from your kids from a deeper need – a clean heart (see Psalm 51). 13. Rest: It is only rest in God’s presence and grace that will make you a joyful and patient parent. This may surprise you, but I cannot think of any directive from the mouth of Jesus that is a more appropriate call to every Christian parent than the Great Commission (Mathew 28:18 – 20). 14. Mercy: No parent gives mercy better than one who is convinced that he desperately needs it himself. Hebrews 4:14 – 16 gives us a model for a life-long mission of humbly, joyfully, and willingly giving mercy. Many Christian mothers and fathers are exhausted, discouraged, and frustrated. It's time we consider a new and better way: the way of grace. Parents, God will bless you with his presence, power, wisdom, and grace. He faithfully parents you, so that by his faithful grace you can faithfully parent your children. In every moment of parenting, the wise heavenly Father is working on everybody in the room. That's why I wrote Parenting: 14 Gospel Principles That Can Radically Change Your Family. Dr. Paul David Tripp is a pastor and best-selling author. His book Parenting: 14 Gospel Principles That Can Radically Change Your Family was #1 on Amazon and was named Book of the Year by the Evangelical Christian Publishers Association for Christian Living.